Artist "Gävle Symphony Orchestra & Jaakko Kuusisto"
is a Swedish symphony orchestra based in Gävle. Founded in 1912, the orchestra initially gave its concerts in the Gävle theatre and Mariners' Church. In 1998, a purpose-built concert hall was constructed overlooking the river Gavleån. 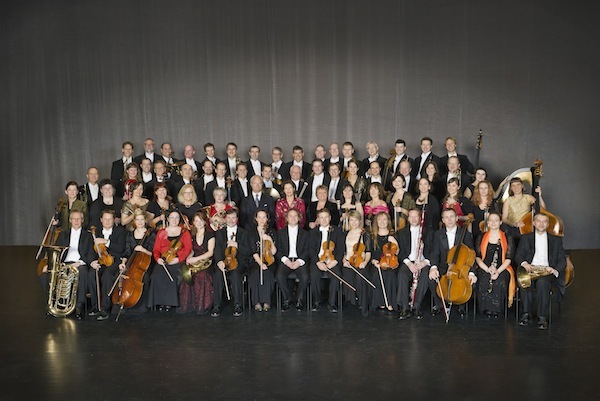 The orchestra has 52 permanent members. Among its discography are recordings of Tre Dalmålningar by Oskar Lindberg, Xaver Scharwenka's Symphony in C minor, symphonic poems by Franz Berwald; orchestral works by Gustaf Bengtsson, Oscar Byström's Symphony in D minor, Jacob Adolf Hägg's Nordic Symphony; orchestral music by Armas Järnefelt, Otto Olsson's Symphony in G minor, Kurt Atterberg's violin and piano concertos; a concert live from the Amsterdam Concertgebouw with works by Grieg, Svendsen and Shostakovich with Carlos Spierer, Rosa Arnold, Enrica Ciccarelli; Sven-David Sandström's piano concerto. Since 1 July 2012, Jaime Martín has served as the orchestra's artistic adviser, and on 1 July 2013, he became the orchestra's principal conductor. Conductor, composer and violinist Jaakko Kuusisto enjoys an extensive career that was launched by a series of successes in international violin competitions in the 1990s. Having recorded concertos by some of the most prominent Finnish contemporary composers, such as Rautavaara, Aho, Sallinen and Pulkkis, he is one of the most frequently recorded Finnish instrumentalists. When BIS Records launched a project of complete Sibelius recordings, Kuusisto had a major role in the violin works and string chamber music. Moreover, his discography contains several albums outside the classical genre. He was concertmaster of the Lahti Symphony Orchestra during 1998 - 2012. Kuusisto’s conducting repertoire is equally versatile and ranges from baroque to the latest new works, regardless of genre. He has worked with many leading orchestras, including Minnesota Orchestra; Sydney, Melbourne and Adelaide Symphony Orchestras; National Arts Centre Orchestra in Ottawa; NDR Hannover, DeFilharmonie in Belgium; Chamber Orchestras of Tallinn and Lausanne; Helsinki, Turku and Tampere Philharmonic Orchestras; Lahti Symphony Orchestra as well as the Avanti! Chamber Orchestra. Kuusisto served as principal guest conductor of the Oulu Symphony Orchestra during 2005-2009. He works regularly in opera as well; in 2016 he orchestrated and conducted Indigo at the Finnish National Opera, a work written by Eicca Toppinen and Perttu Kivilaakso of Apocalyptica. Kuusisto has been appointed Chief Conductor of the Kuopio Symphony Orchestra, starting August 2018. Kuusisto performs regularly as soloist and chamber musician, and has held the position of artistic director at several festivals. Currently he is the artistic director of the Oulu Music Festival with a commitment through 2020. Kuusisto’s compositions consist of nearly 40 opuses: chamber and vocal music, orchestral pieces, operas, as well as music for films. His family opera, The Canine Kalevala, was hugely popular at the Savonlinna Opera Festival and has since had several productions elsewhere. Moreover, his latest opera Elämälle about composer Oskar Merikanto’s life was received with acclaim at the Ilmajoki Music Festival in June 2015 and 2016. Kuusisto's next opera, Jää (Ice) is based on the award-winning book by Ulla-Lena Lundberg. Commissioned by the Finnish National Opera, it will be premiered in January 2019 with Kuusisto conducting. Kuusisto also works regularly as arranger/orchestrator in various projects; most notably, he has written arrangements for acclaimed vocal ensemble Rajaton and the Lahti Symphony Orchestra for their shows highlighting the music of Queen and The Beatles. These shows have been performed by many leading orchestras including Minnesota, NDR Hannover, Toronto and the New York Pops. The President of Finland awarded Jaakko Kuusisto with the Pro Finlandia Medal in 2017.